The smallest multi-function patch clamp system available. This patent-pending design has an 8″ x 8″ footprint; it is the smallest multi-function patch clamp system available. 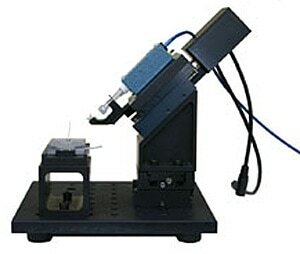 The automated patch clamping system replaces the microscope and the manipulator in the traditional rig. Complete with one automated manipulator, a manual XY stage, a data acquisition board & control system, and a perfusion chamber with the platform, this system can automatically guide electrode to make a seal on oocytes, suspended cells and cells on cover slips. The specially designed perfusion chamber guarantees that when oocyte or cells are dropped into the chamber, it always reaches the known position. The tip of the pipette can reach this position with an accuracy of 0.05 mm, assuming the tip of the pipette is perfectly concentric. The movement of the patch pipette is controlled by a computer and can be programmed to stop when the tip touches the cell membrane. The pipette positioning system provides widely different approach speeds and proximity criteria, allowing the researcher to fine tune the process for the perfect seal. The computer controlled system eliminates human errors so the success rate of making gigaohm seals using the PatchMAX 100A is over 90%. The approach and sealing parameters can be saved and reused. Once you have found the perfect set of parameters, you can save it to a file for use at other times, or by other researchers. When a new person joins the lab, he will be able to learn the patch clamp technique simply by using the saved lab protocols. The system is noise-free during recording. The motorized stage is tuned so that the electrode is stationary when the power is turned off. You will be able to do single channel recording without worrying about noise from the motor. The two modular dovetail linear stages allow you to set, lock and forget. They are less susceptible to shock and vibration. The motorized stage can hold its micro-step position (50 nm resolution) overnight, even without current! The patch pipette is fixed by a supporting arm so even when the electrode holder is touched, the tip of the patch pipette does not move much. Due to the fact that there are very few moving parts in the system, the device exhibits very low drift. With the PatchMAX 100A, patch clamp experiments become less stressful and labor-intensive. Since the manipulator is controlled by a computer, you do not need to touch the manipulator during the experiment. Your computer will control the process of excising a patch in a manner that is precise and always reproducible. Not only can you run the protocol for making a seal, but you can also control the manipulator manually as easily as clicking a mouse. Thus the manipulator can act like a traditional manual manipulator. The manipulator comes with a standard mount so it can be removed for other type of experiments. Two specially designed perfusion chambers allow fast solution change. Detailed information is available in Patch Clamping Accessories.